Book Of The Month: February 2016. Every month we will share our book recommendations with you. We select our favourite reads from best-sellers to the critically acclaimed to up and coming new authors to ensure we have something for book lovers of all tastes. April Landau thinks she has everything she’s ever wanted. Her high school sweetheart, a house she can’t afford, her bipolar tabby cat, and she’s all set to begin her Junior year of college. Just when she least expects it, her life gets thrown for a loop. When things between her and her long time boyfriend unravel, she finds herself struggling to keep her head above water. Enter Jared Hoffman. He’s her complete opposite. A high school drop out who was forced to take over his parent’s business after their untimely death. It’s no surprise this tragedy affected him greatly, causing him to recede almost completely from society. But he has one secret. A secret he’s been carrying around for years. What happens when their worlds collide? Can an old friendship be the one thing that brings these two back to life? Amazon Review By lexiesmomma_32 October 4th, 2015. Amazon Review By Andrea Heltsley October 19th, 2015. 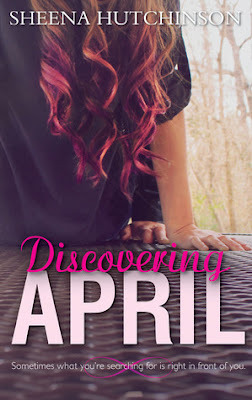 "April is a wonderfully complex main character going through some major life issues. I liked that it wasn't about abuse or cancer, or more depressing issues. The author developed an intensely emotional plot with an epic romance that unraveled in a steady pace. This was a new adult book worth checking out! I look forward to reading the next book by Sheena Hutchinson! Five glittery stars!" @LadySara. Simple theme. Powered by Blogger.